To get ready for his showdown with Daniel Cormier at UFC 226, heavyweight champion Stipe Miocic will be working with another light heavyweight champion to help get him ready. 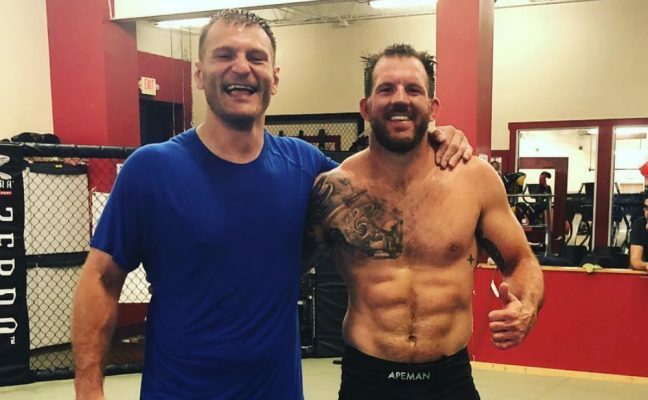 This past weekend, Bellator 205-pound champion Ryan Bader traveled to Cleveland to work with Miocic and his team at Strong Style MMA. Bader is not only the light heavyweight champion in Bellator but he also has plenty of history with Cormier after they were scheduled to fight back in 2015 and then engaged in a bitter war of words after the matchup didn’t happen. Add to that, Bader is a former college All-American wrestler with serious knockout power so he can definitely add a layer of what Cormier does best to help Miocic get ready for their fight on July 7 in Las Vegas. Sources said that Bader will be coming and going throughout Miocic’s camp with plans for the two champions to work together several times ahead of the upcoming fight against Cormier. The fight will serve as the first ever UFC bout pitting the light heavyweight champion against the heavyweight champion. Miocic will also look to extend his title defense streak as he already stands as the longest reigning champion in UFC heavyweight history. As for Bader, working with Miocic will definitely be beneficial as well considering he’s preparing for a fight at heavyweight against Matt Mitrione as part of the ongoing Bellator grand prix.